Many years have passed since the first Emmegi brand machines were launched in the USA. That was back in 1978. Not so far in the distance past was the opening of the Emmegi USA inc. subsidiary, with registered offices in New Jersey, in 2006. The company established itself in the market, initially securing its place over time, and then making a name for itself directly in the territory. In perfect synch with the Group's philosophy and commercial strategy. As is the very concept of this subsidiary, which reflects the founding values underlying the company mission: innovation, quality, “all around” approach. It is no coincidence that the cutting-edge American showroom includes a training room, offering a perfect combination of theory and practice. And where the state-of-the-art technology that distinguishes the group's machines is shown in detail. 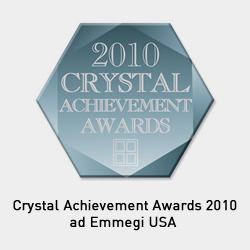 Revealing the reasons why Glass Magazine conferred the prestigious Crystal Achievement Award to Emmegi USA. Diamant, Planet and Satellite were, in fact, recognised as the most innovative products of 2010, once again highlighting Emmegi's role as a trendsetter in the sector. A role that the company is constantly confirming by participating in the most important events, such as GlassBuild, for example, with considerable investments. Emmegi USA is therefore the perfect representative of the overseas parent company and maintains a constant, direct and fruitful relationship with the headquarters in Limidi, thanks also to the presence of an Italian CEO in loco.